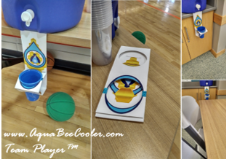 Retailer, wholesaler, or individuals who are interested in selling the Team Player TM disposable drip tray, send an email to (aquabee@aquabeecooler.com) and request a quote for the quantity you want to purchase. Use email subject “Request for Quote." Let us know if you are interested in using your logo or a custom event or company graphic for the main display. We are excited to provide you with excellent service.